How do you let natural light in to an outdoor structure? A family in the King’s Park area of South Australia is now enjoying a new outside living area on a budget, thanks to Brian Rohan and Derek McNamee from our Outside Concepts Eastern South Australian branch. The timber-framed verandah has been perfectly situated at the back of the house to utilise large French doors that provide access to the backyard. The verandah also makes use of an existing paved area. 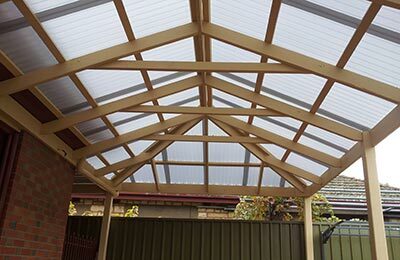 Rather than going to the extra expense of tiling the roof to match the house, the clients chose to cover their new verandah in a combination of powdercoated steel and polycarbonate roofing. Combining the two roofing materials is a great option if you love the look of steel roofing but want to still allow natural light to flow into the outdoor area and the house. The finished project not only provides a perfect place for the family to enjoy relaxation and entertainment opportunities, it has also added tremendous value to the home.